Fintechs can analyze startups, trade stocks at high frequency, make lending decisions for loan applicants and move money from your paycheck to your savings account. Equipped with big data and connected to almost 7 billion information collecting portals, innovative startups have transformed the finance industry. Using algorithms to discover patterns and generate insights from the data they are exposed to, self-learning machines can make split second decisions at ultra high volumes, performing tasks that previously required an army of briefcase yielding, high paid soldiers. Research and development initiatives have transformed the finance industry into a high tech, automated, computer driven, and artificially intelligent (AI) sector. When engineers and computer scientists develop artificial intelligence solutions for the fintech industry, they may be eligible for Research and Development Tax Credits which are available to stimulate innovation. The key to effective artificial intelligence is data. As data becomes increasingly accessible, it fuels momentum in the artificial intelligence sector. Small business lenders use new data sets to make more informed credit rating and lending decisions. Some innovative lenders use it as a business development tool as well. They partner with accounting software platforms who feed them data, which they then use to identify business owners who are in need of capital. The benefit is twofold; lenders utilize the data not only to identify and target borrowers, but also to assess their ability to repay loans. There are other benefits as well. Computers can analyze data in an instant which in turn allows lenders to make split-second decisions without a face-to face meeting. In other words, lenders benefit by saving on operating expenses, while business owners gain access to same-day capital. This innovative new way of financing is not just limited to small businesses either. The terms of one’s next personal loan might depend less on credit score and more on habitual data collected by one’s smartphone. Digital lenders don’t just analyze an applicant’s paycheck and payment history. Better indicators of credit worthiness may perhaps be found in SAT scores, spending habits, level of education and even response rates to text messages. But how much of this data is actually relevant? Currently, many startups are in the stage of analyzing patterns in order to provide answers to that very question – or at least the machines are. Self-teaching algorithms guide self-learning machines towards not only the data that’s worth collecting, but appropriate inferences that should be drawn from it as well. Digital lending is quite the phenomenon. Currently, there are over 2,000 digital lending startups across the U.S. and Europe, most of which use some level of artificial intelligence. Fundera Inc., located in NYC, provides a marketplace for small business loans. It works with a group of handpicked and rigorously screened vendors, giving borrowers a place to compare, shop and apply. Boston, Massachusetts’s-based Underwite.ai does just as the name implies. Founded in 2015, by Marc Stein, the startup makes lending decisions using predictive models of machine learning which are generated by a computer algorithm, as opposed to determinations made by statisticians based on their interpretation of linear regression data. By applying advances in machine learning, and analyzing thousands of data points, Underwite.ai claims they are able to radically outperform traditional scorecards in both consumer and small business lending. Not quite wealth management or portfolio analysis, one sector built using artificial intelligence involves applying machine learning techniques to consumers’ day-to-day spending and saving habits. These digital assistants often have names like Olivia or Erica. They help customers make smarter investment decisions, put away money into savings or retirement accounts and alert users when they are nearing their budget limits. Linked to the cloud, personal bank accounts and credit cards, they can track spending habits and provide updates in real time about a user’s personal financial situation. Some of them even make real decisions such as lowering the thermostat or shifting money into a higher interest rate bank account. Founded in 2013, San Francisco startup Digit Inc. created an app that analyzes spending habits and safely sets aside small amounts of money for users. For example, depending on a person’s cash flow, goals and personal preferences, every 3-4 days a random sum of money is moved over to a savings account, held at Digit and invested to earn a premium. Also founded in 2013, New York City startup MoneyLion Inc. uses machine learning and big data to regularly underwrite loans at affordable rates. Student loans, credit cards, car loans and other personal finances are automatically assessed and consolidated repeatedly as the market fluctuates to provide consumers with the lowest possible market interest rates. Debitize Inc., also based in NYC, helps consumers spend responsibly. The company transforms credit cards into debit cards by providing a mechanism which consumers use to back up every credit card purchase with real money from their checking account to ensure that their balance is paid in full each month. Some call them robo-advisors. Financial institutions see them as a good way to automate decision making. Discount brokerages use them as a way to offer money management services for reduced fees. Whatever the case, one thing is clear: artificial intelligence has significantly disrupted the way financial funds and portfolios are managed. 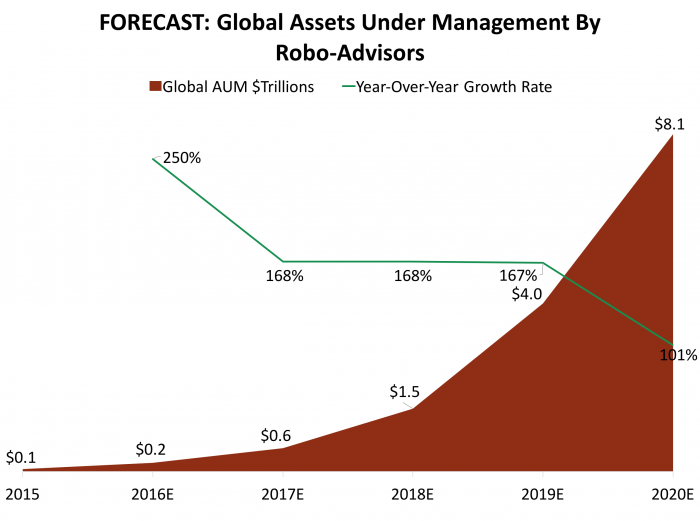 In 2014, automated financial advisors were estimated to have at least $14 billion in global assets under management. That figure is expected to grow substantially. According to projections from Business Insider Intelligence, 10% of all global assets under management will be automated by 2020. That equates to roughly $8.1 billion as demonstrated in the chart below. The range of wealth management services offered by automated technology varies from company to company but generally includes investment advising, basic advice, account aggregation, risk assessment, financial planning, re-balancing and even tax optimization. Ultimately, the advent of the robo-advisors means empowerment for the basic investor who, instead of turning to traditional financial advisors, will turn to an algorithm warehouse that will generate an appropriate investment strategy based on inputs from the user. Traditionally, wealth management services were reserved for the wealthy with minimum investment requirements ranging from $100,000 to $250,000. Artificial intelligence capabilities, however, have provided access to portfolio investment services with increasingly low minimum balance requirements. Schwab, the nationally known discount brokerage firm in San Francisco, California requires a mere $5,000 for access to its automated “intelligent portfolios”. Some startups are even more competitive. Stash Investments LLC, a NYC-based startup and SEC registered investment advisor, recently developed a mobile app that allows users to choose from over 30 different investment options with a shockingly low minimal investment of only $5. Users can even buy fractional shares in publicly traded companies, allowing them to invest whatever they can afford. Given the hype around AI, one would expect venture capitalists (VCs) to jump on the bandwagon. Indeed, they are. VCs use machine learning to analyze startups, mine for data and predict technology trends. One company even developed a fully automated computer analyst dubbed “The AI VC.” When human venture capitalists depart for their summer season breaks, the “humanoid” fills the void, asking questions, collecting data and scheduling pitches for review by human colleagues. Other fintech companies use a more subtle form of AI. CB Insights in New York City uses artificial intelligence to mine data for venture capitalists in order to predict technology trends and identify investment opportunities. Thinknum, Inc. also based in NYC, monitors information on companies and markets to facilitate data driven investment. Users include venture capital firms, hedge funds and investment firms. They use Thinknum's intelligence driven tools for research and data analysis which enables them to generate unique, intelligent insights. Artificial intelligence is generating a buzz in the fintech industry. Driven by data, computers use algorithms to discover patterns, generate insights and learn from their environments. Research and Development tax credits are available for financial technology firms who are developing and integrating this technology.